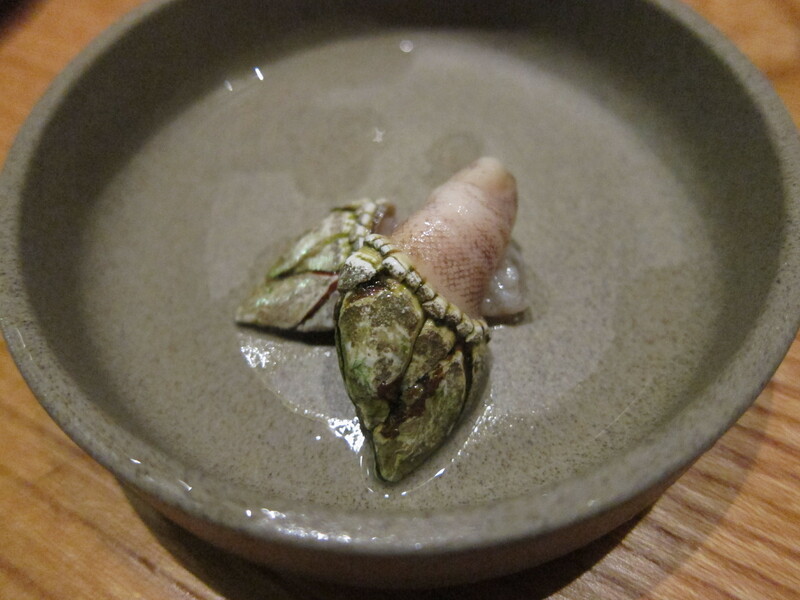 The Easter food foraging continued yesterday with J making a reservation for 9 of us at another Japanese Izakaya called Sakaegawa. 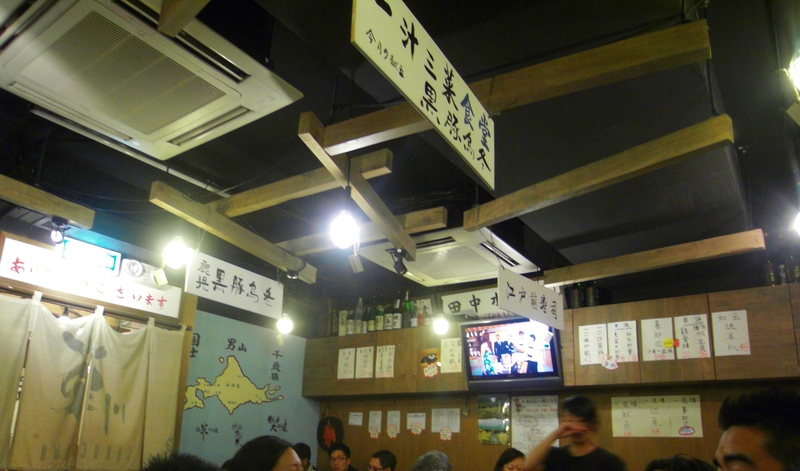 This place is part of G’s ongoing Izakaya quest and I was surprised to find that it was also in Causeway Bay. I’m beginning to think Izakayas don’t exist anywhere else on the island except around Times Square, and I wonder if it’s because they like the fresh seafood from the fish market on Bowrington Road, or whether all the Japanese chefs just decided that they liked the bright lights of Times Square! Anyway, whatever the reason, I’m happy as it’s easy to get to and you can always do a spot of shopping or pet shop gazing after your dinner. 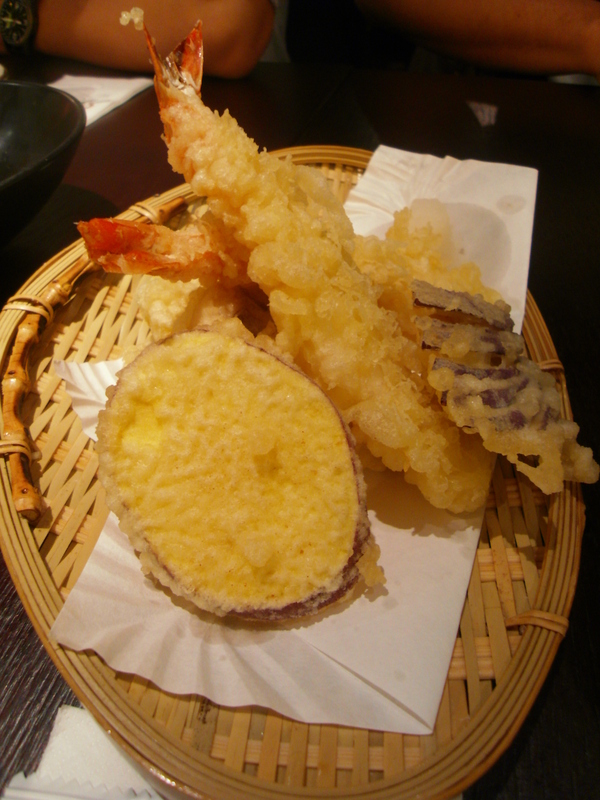 Unbeknownst to me (until after the meal), Sakaegawa used to be the fine dining Japanese restaurant at the Ritz, and it took nearly a year after the hotel closed down before the restaurant reopened independently. It’s tucked away inside a building off Hennessy Road, which took our friend Q, J and I a bit of time to find, partly due to lack of sense of direction and trying to follow Google maps on the Blackberry. 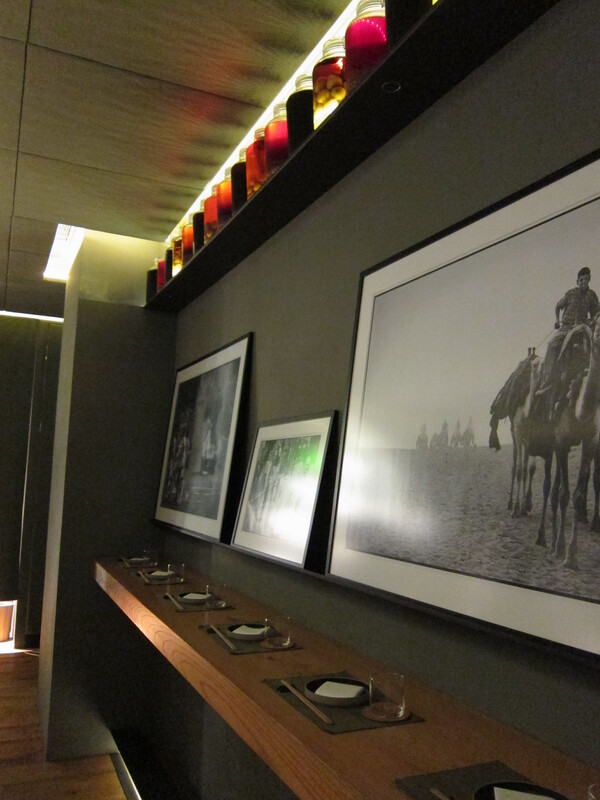 When you enter Sakaegawa, you will be struck by the quaint and simple decoration; the Japanese maps on the wall and the curious planks of wood hanging from the ceiling which add to the charm. Everyone was starving as usual, so it was only natural that G and P ordered almost the entire menu for us. 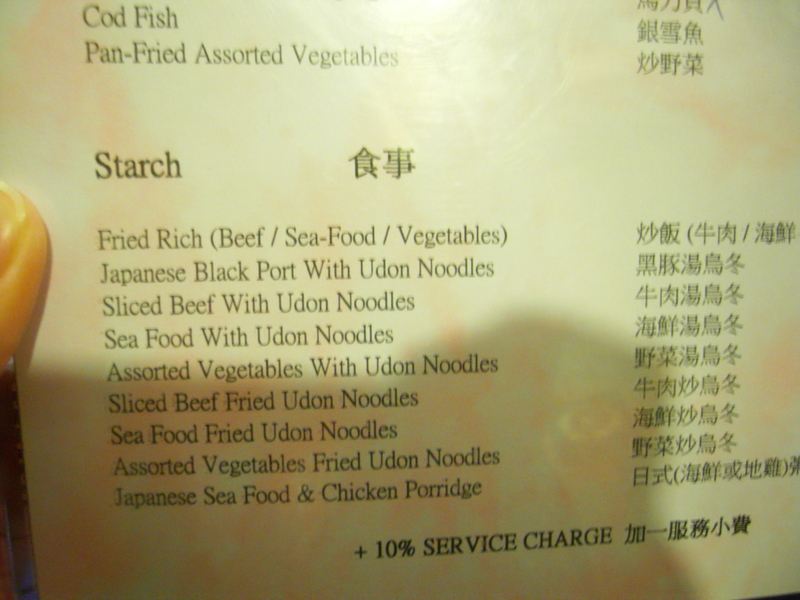 One thing that did raise a few eyebrows was the strange heading of “STARCH” on the menu. I mean, I know carbs are everyone’s weakness, but do you need to make us feel guilty by spelling it out so blatantly like that?! 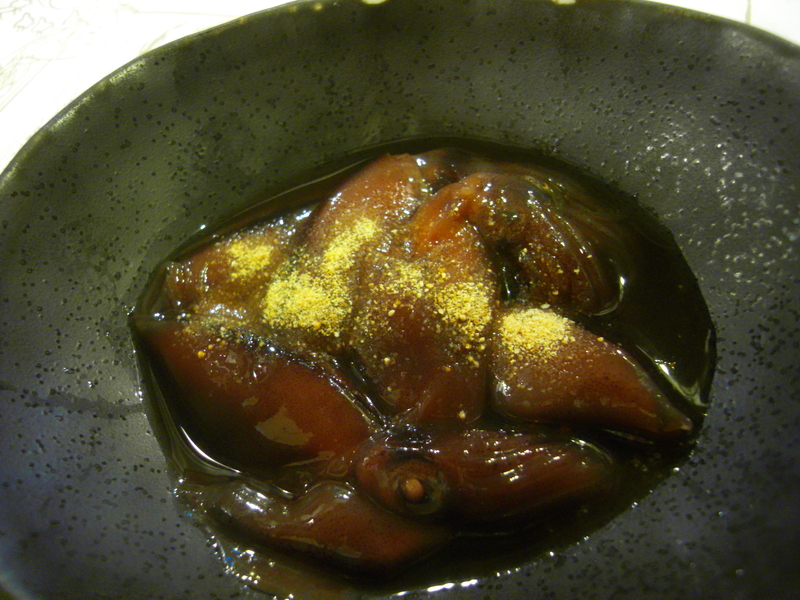 Our friend Q was extremely excited when she spotted marinated squid. 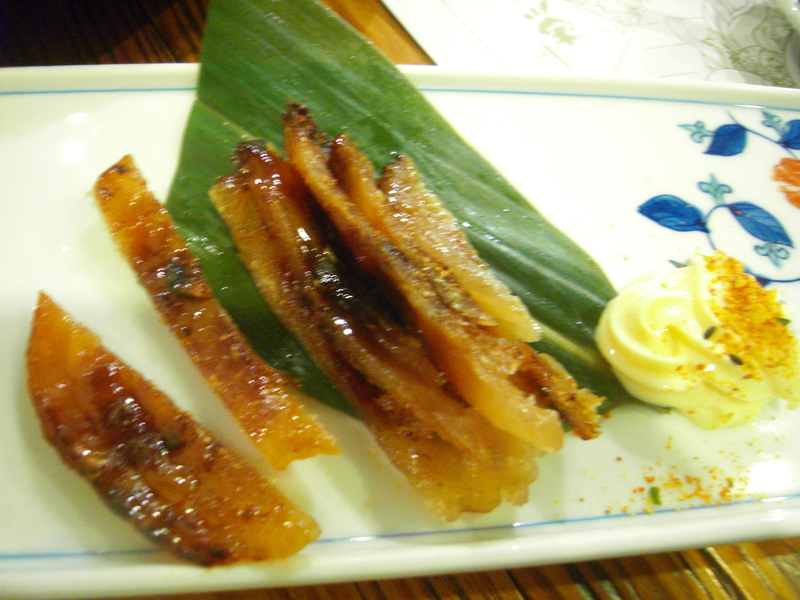 When the squid came, it looked very nondescript in its tiny bowl but the taste woke me up with its saltiness and dried fish taste. Q the marinated squid expert declared that this squid was good and salty and as she was enjoying it so much, we gave her the rest of the squid to munch on. 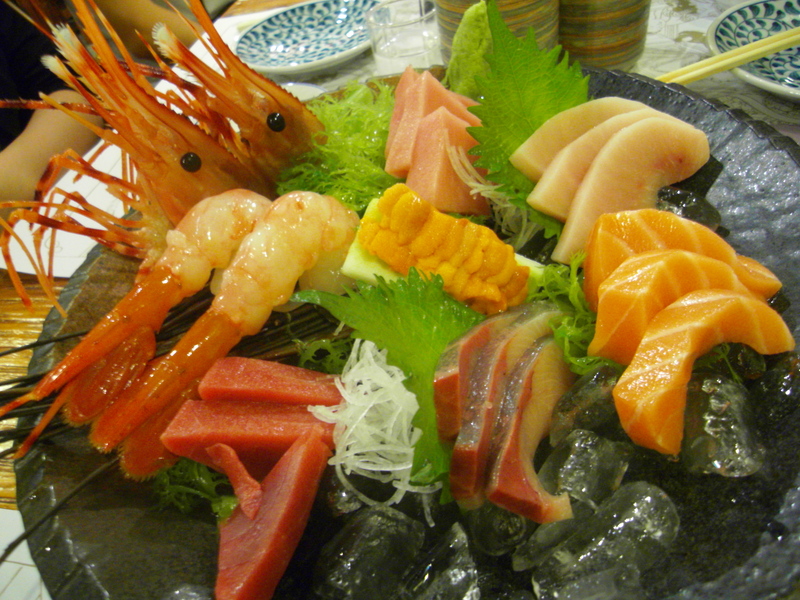 Next up was the most expensive item on the menu at $380, the sashimi platter. My half of the table kidnapped it, so the other half had to order one for themselves. 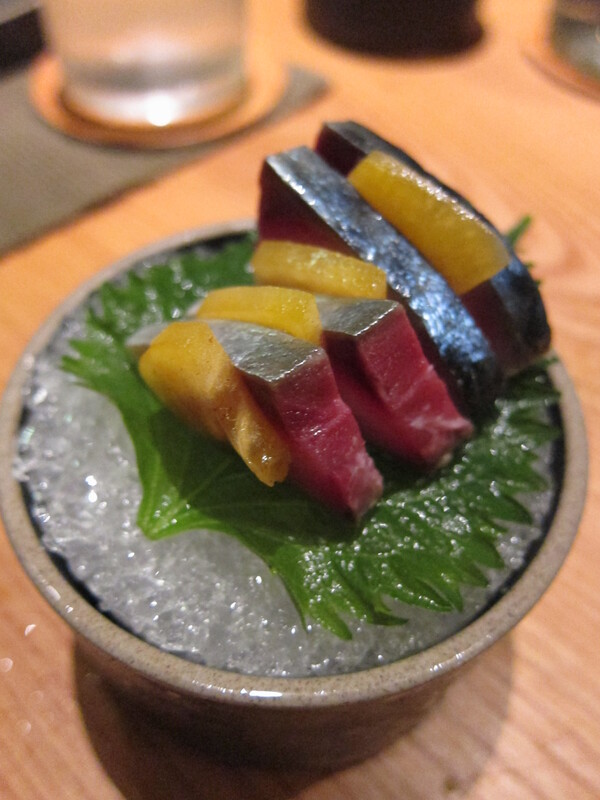 The sashimi was lovely and fresh. 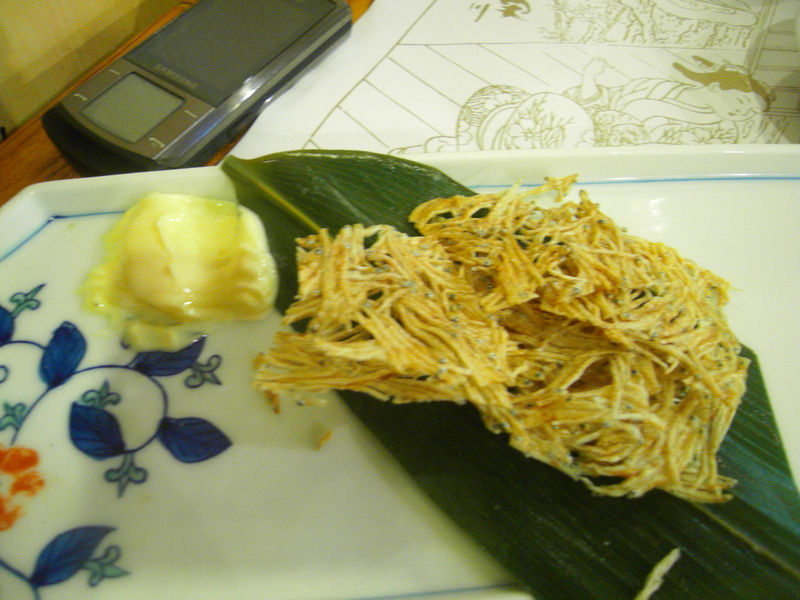 I especially liked the salmon which was thickly cut and just the right kind of fatty. Highlights were the dried blowfish– yummy and tasted like Bee Cheng Hiang’s baakwa (BBQ meat), dried minnow fish– addictive snack like dish, agedashi tofu, sliced pork with udon noodles in soup (the soup was quite moreish) and the soft shell crab and california sushi rolls which I loved, but I suspect it’s because I am a mayo addict and I still had a sore throat, so the mayo was soothing! 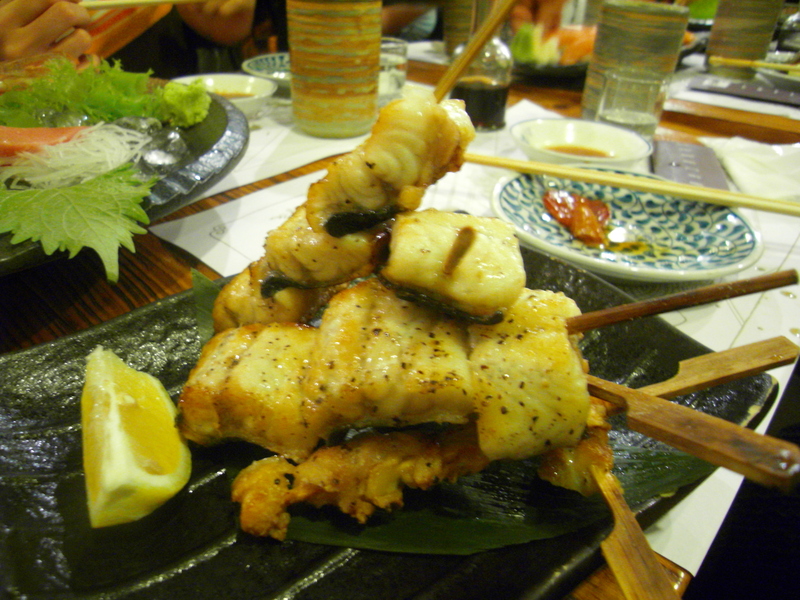 The guys also loved the black cod, which J said was very good, and the grilled eel and ox tongue on skewers. Krispy K selfishly ordered only 1 foie gras on toast which turned out to be the size of a mini doughnut so she just ate that one all on her own. Apparently it tasted very yummy.. (Thanks Krispy for sharing 😛 *joke*). I have it on good authority from P that Sakaegawa missed out on one of the classic dishes called 出汁巻き卵 in japanese which means egg roll cooked with fish stock. 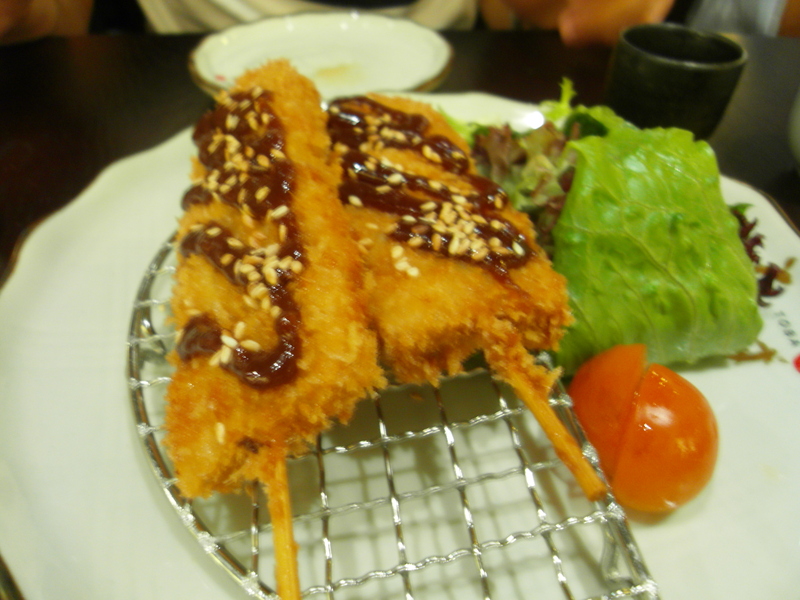 Apparently most izakayas would have it and it is “soooooooo good”, so P was a bit sad that that wasn’t on the menu. After ordering a second round of sushi, skewers, salad and chicken wings, we asked the waiters if we were the worst group they’d had in terms of greediness, but apparently we were pretty tame compared to some! G was the sake man of the night, flagging down the waiter for sake recommendations, but I sadly couldn’t tell you what kind of sake was drunk, except there were 2 types last night and everyone seemed fairly loud and merry by the end of it. 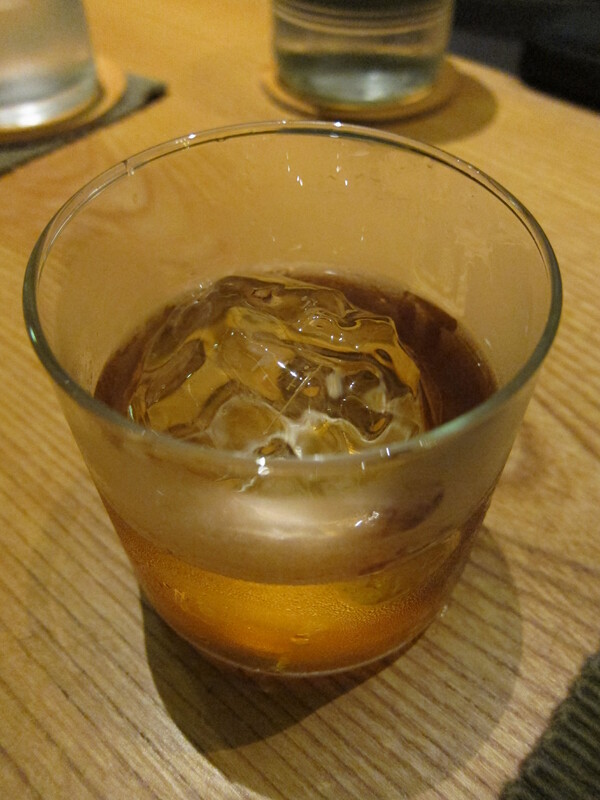 Categories: Japanese | Tags: Causeway Bay, Izakaya, Sakaegawa, Sake | Permalink. I am a miso ignoramus. I am that person you see in the supermarket aisle reaching for the cheats’ instant miso soup packets and not caring about the ridiculous amounts of sodium and MSG in them. 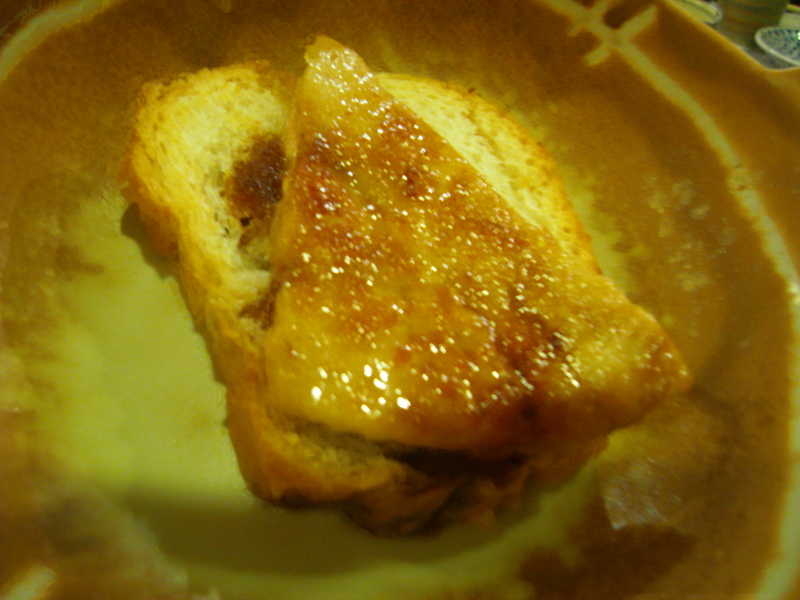 I can just about tell you that there exists white miso and red miso but other than that… zilch knowledge. This lack of information (appalling for someone who eats as much Japanese food as I do and drinks miso soup like it’s going out of fashion), was made apparent to me when my food monster friends and I went to this relatively new Japanese place in Causeway Bay. 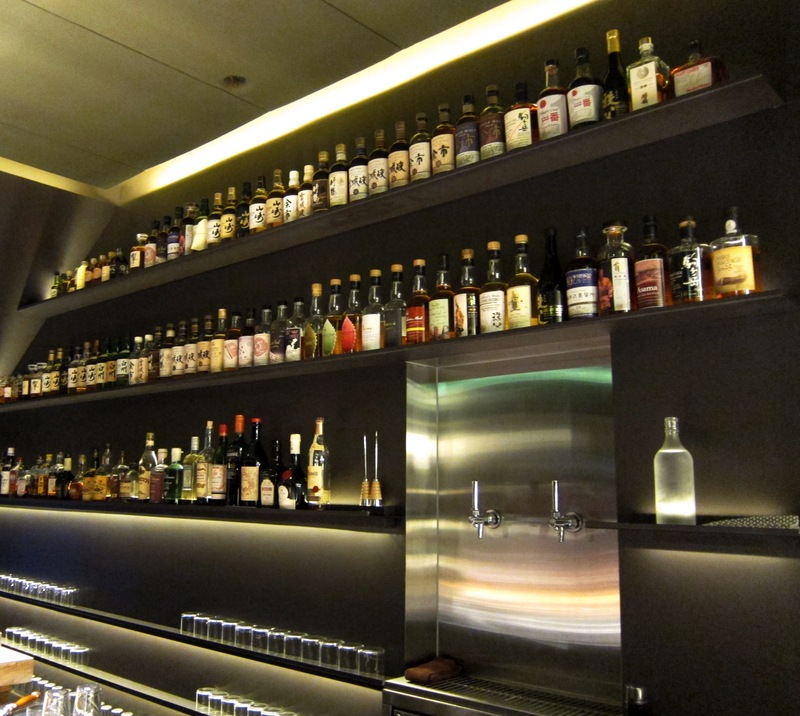 Toba Nagoya is a compact, chic and modern looking izakaya that prides itself on its impressive sake list and a obsession with slapping on liberal amounts of Hatcho Miso on all their food except their chicken wings (more on that later). 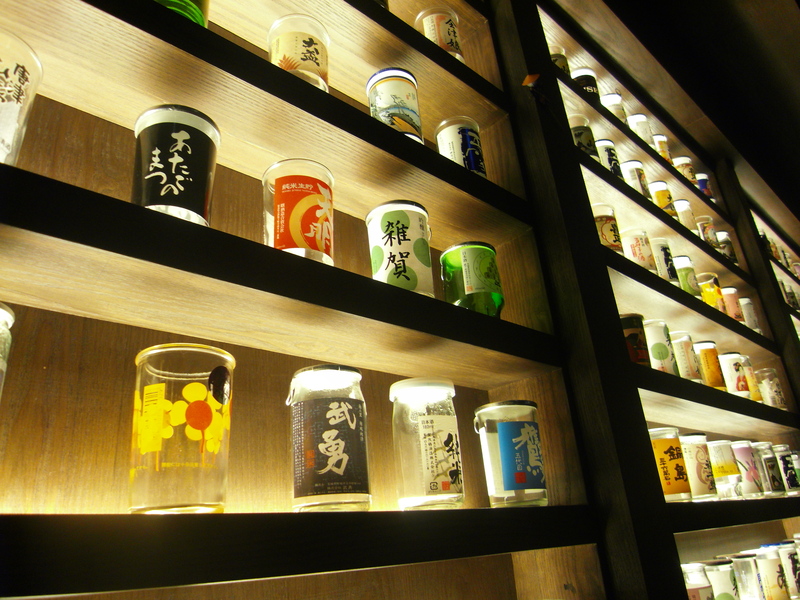 The colourful sake jars lining the shelves make for interesting decoration especially as I have never seen sake jars before- at first we thought they were “special” specimen jars, *ahem* whoops. But before I go on, what is Hatcho Miso? 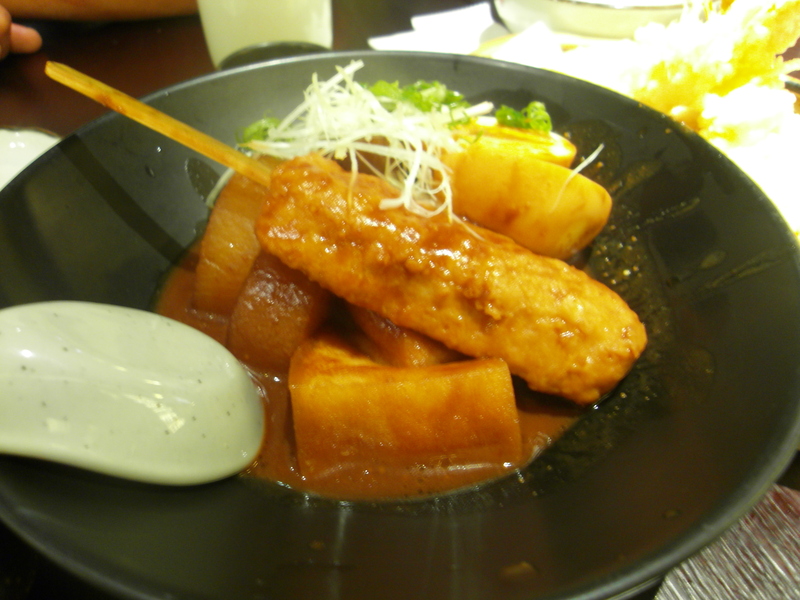 Hatcho miso is one of the 4 most common miso flavours including Shiromiso (white miso), Akamiso (red miso) and Awasemiso (mixed miso). 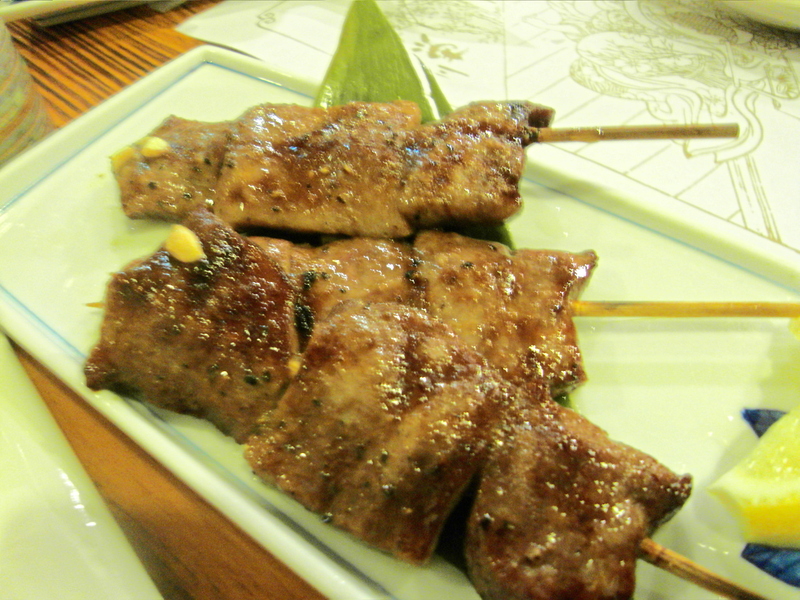 Hatcho miso is darker and browner, is high in vitamins and minerals and has a lower salt and water content. 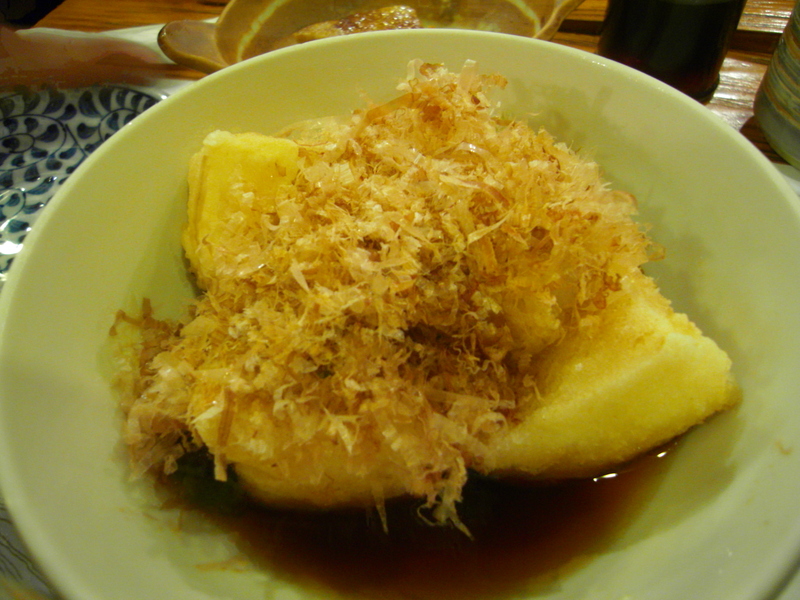 Right, so now we know what the stuff is, how does it taste and how was Toba Nagoya? The staff were cheerful and friendly and didn’t bat an eyelid when we went wild with the ordering. 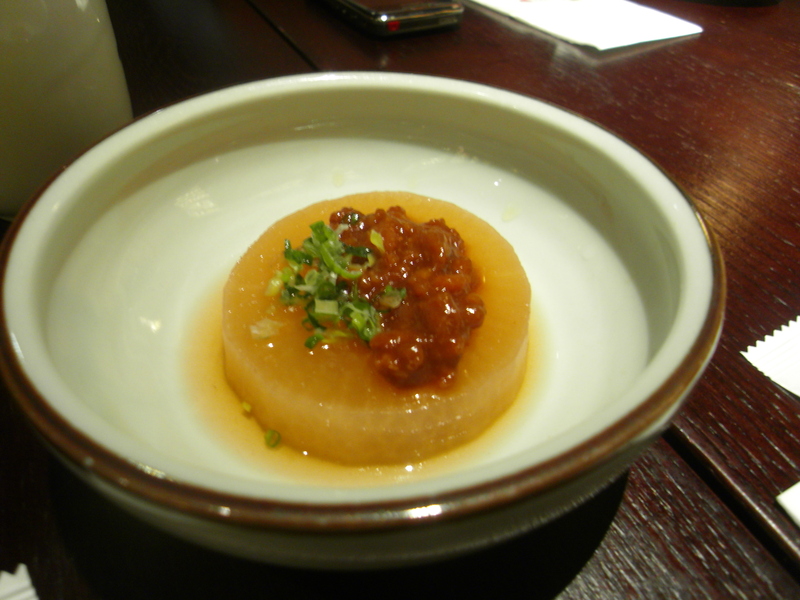 As an appetizer we were given a tasty melon dish topped with hatcho miso which was devoured by my ravenous girlfriend “Krispy K”. Clearly the miso was tasty. As we are greedy people we ordered 2 of everything: the hatcho grilled eggplant, hatcho miso assorted oden-chicken ball, skewered cutlet pork fillets and homemade beancurd. 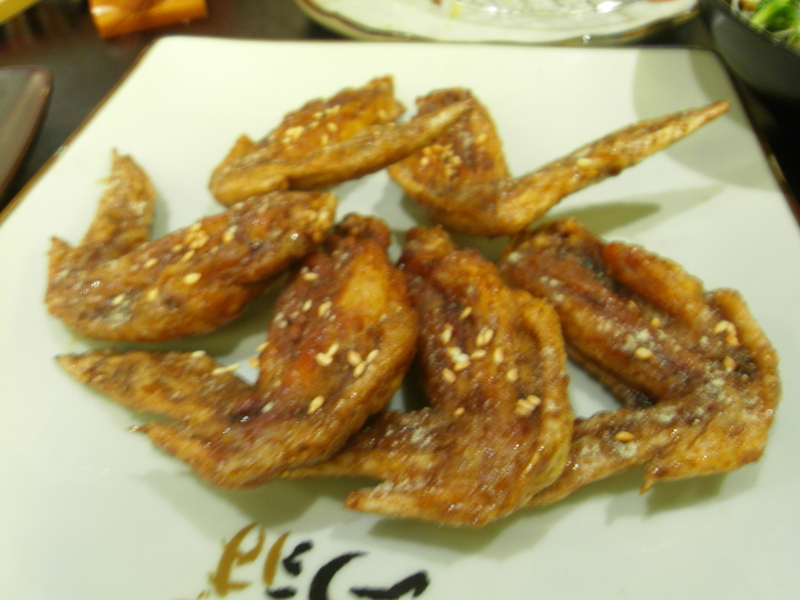 We also ordered their special chicken wings coated with their secret Toba sauce (mild, medium hot or super spicy)- we opted for 1 mild and 1 medium. 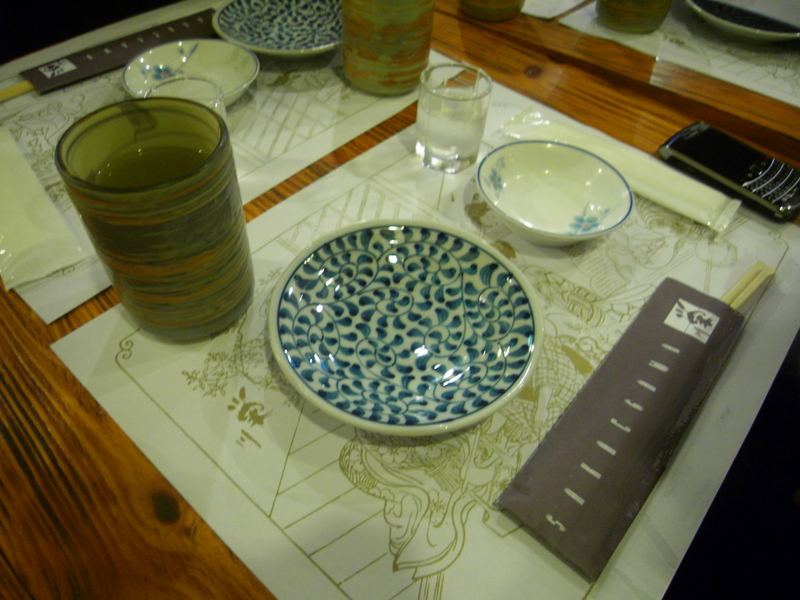 To whet our appetites we asked for some sake and eagerly awaited our feast. 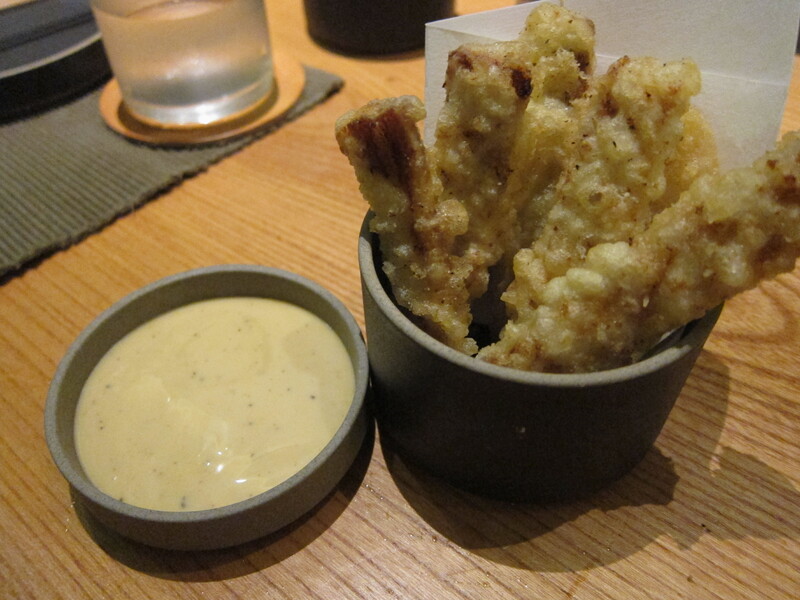 We loved the chicken wings- crispy skin, tender meat, tasty sauce. If my memory serves me correctly, you can get either 6, 10 or 12 chicken wings. As we were filled with glee over the taste, my friend “Chiaphuati” asked for another 10, which we later realised was ambitious given how cluttered our table was. 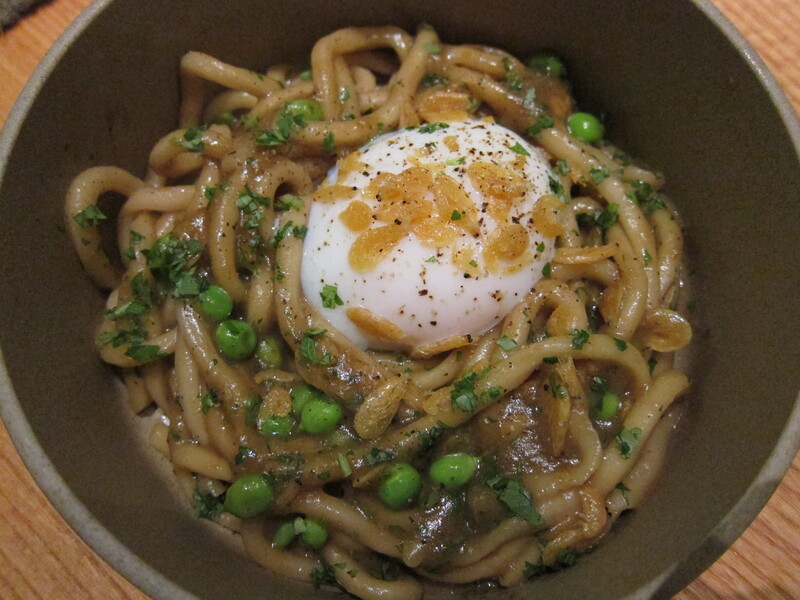 Glazing food with hatcho miso is a clever move. 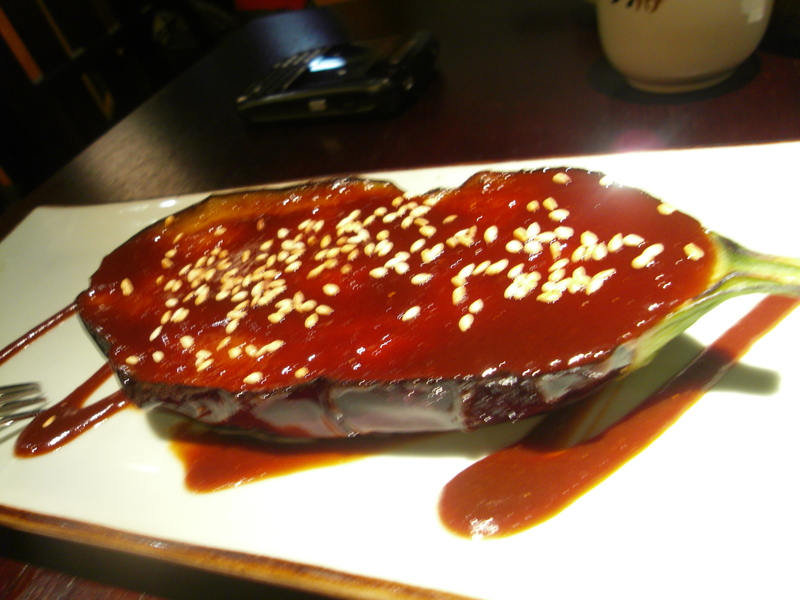 The eggplant went down a treat, so much so that MZ accidentally ordered 2 more and we ended up with an eggplant phobia after dinner. 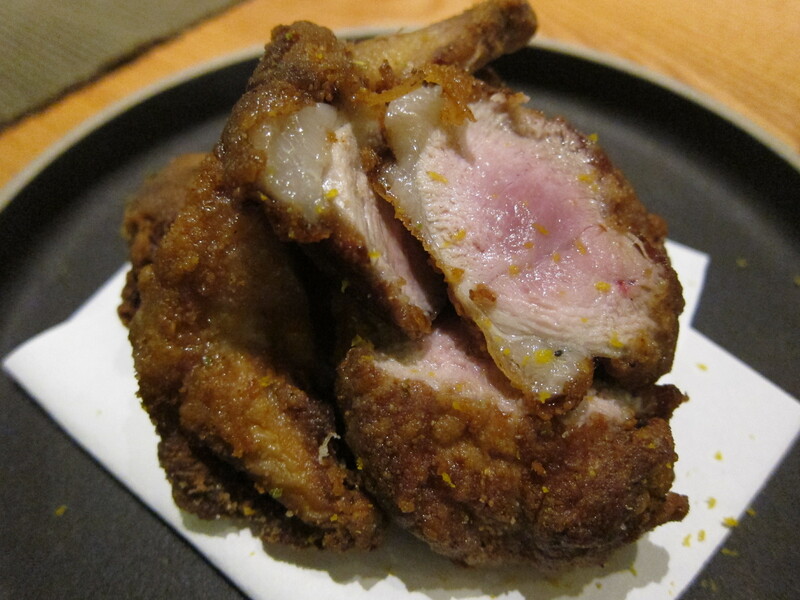 The chicken balls and the assorted veg accompaniment were tasty but if you’re not a fan of soft cartilage then go for the deep friend pork cutlets which were exquisite. The pork was just the right side of fatty, tender and delicious. 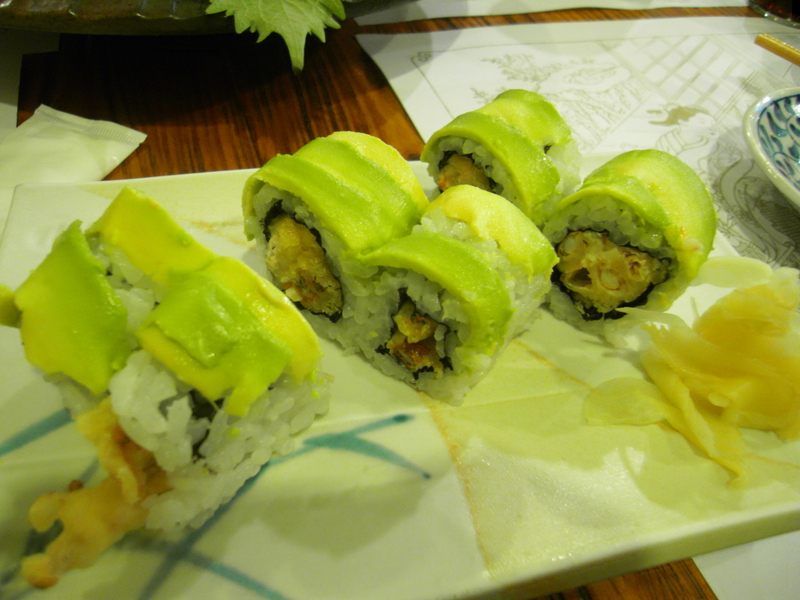 Their assorted tempura and softshell crab sushi roll were very good too and a tasty break from the hatcho miso dishes. 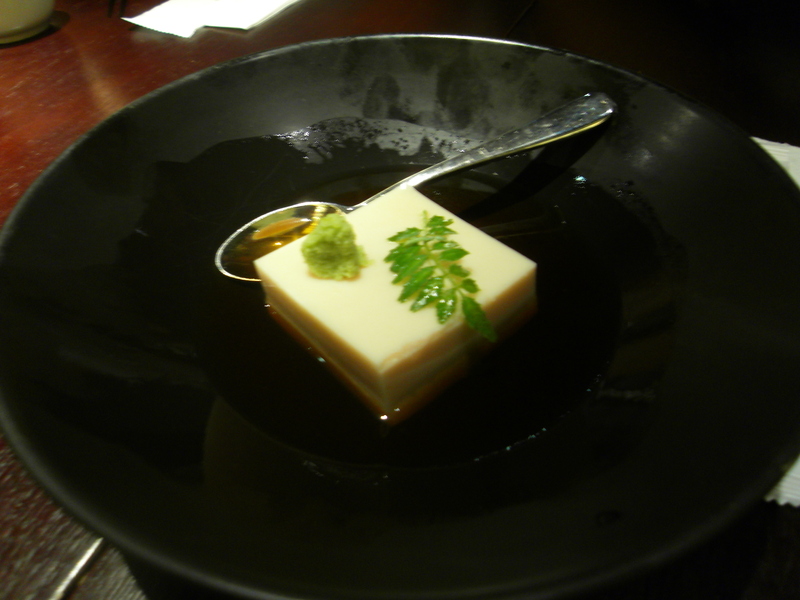 Out of all the dishes, the homemade beancurd was the one disappointment. Perhaps I was missing the point of it but to me it tasted like cheese and was overly fermented. Considering the amount we ordered, the price per head was very reasonable. 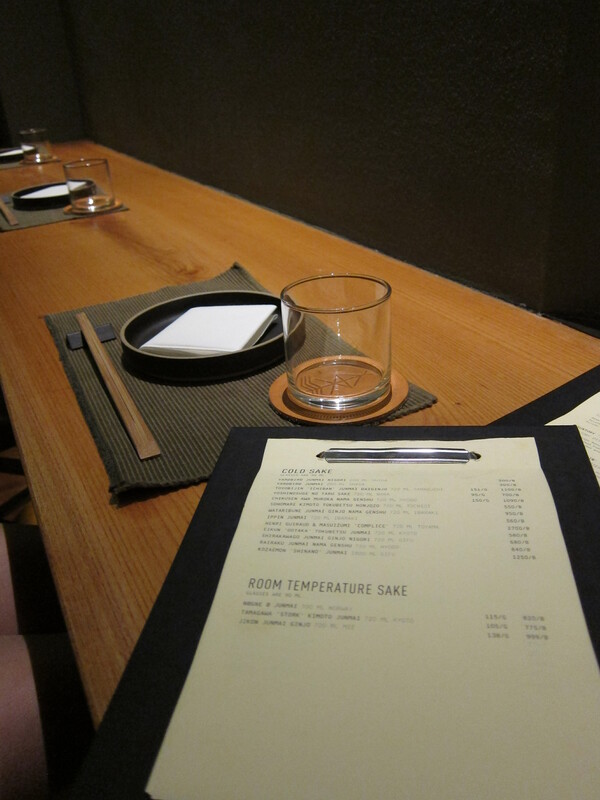 I’ll be back again to try some of their other dishes and to educate myself on sake hehe. 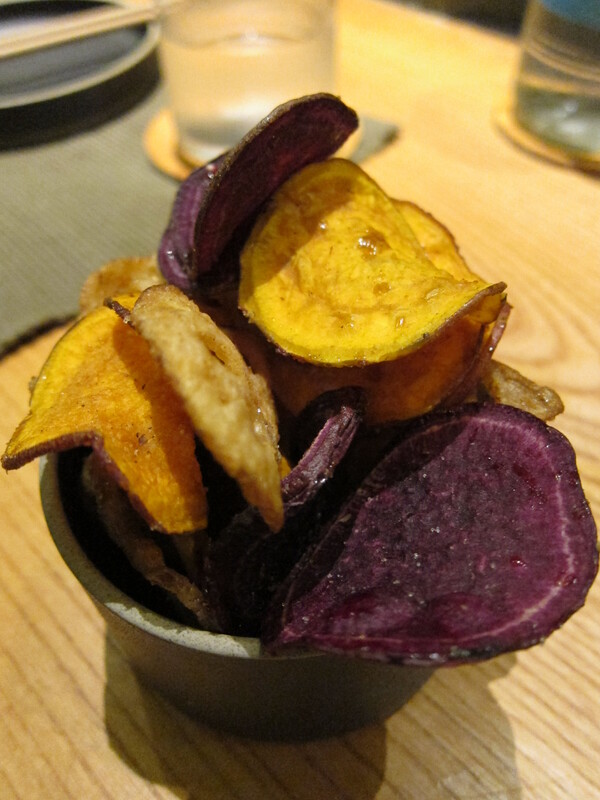 I’ll probably won’t be eating eggplant anytime soon though…. 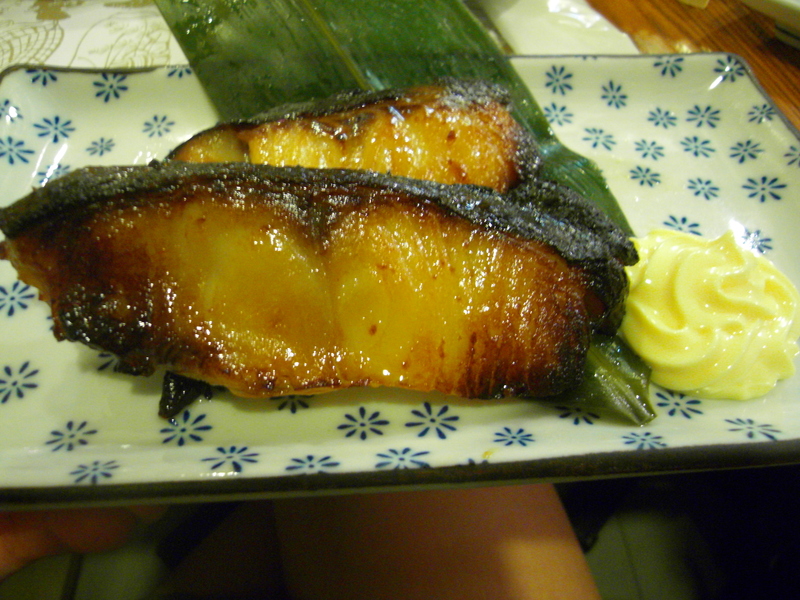 Categories: Japanese | Tags: Hatcho Miso, Izakaya, Miso, Sake, Toba Nagoya | Permalink.